Use the paracetamol dosage calculator if you plan administering paracetamol to your child. 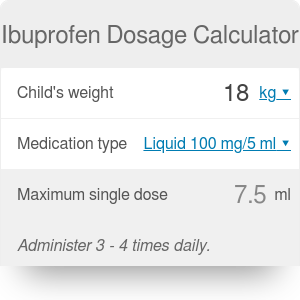 This ibuprofen dosage calculator is a variation of our dosage calculator that calculates the maximum permissible ibuprofen dosage for kids. It will tell you how much solution of a known concentration you need and what dose is not safe to exceed. Please keep in mind that recommended single or daily dosage might be different in your country. The regularly prescribed dosage of ibuprofen for kids is 10 mg per 1 kg of body weight. It can be administered every 6 to 8 hours. You can use the ibuprofen calculator to calculate what is the one-time dose for your child. The meaning of each variable is described in detail below. Drug amount/body weight is the prescribed amount of drug in mg per kg of body weight - in this case, 10 mg per kg. Child's weight is self-explanatory - the body mass of the child. Ibuprofen amount is the one-time dose of medication the child needs to take. Solution strength is the concentration of ibuprofen in the solution, expressed as mg per ml. You should find that information on the bottle. Solution amount is the final volume of ibuprofen solution that is equivalent to one-time dose for your child. Our ibuprofen dosage calculator will also specify the maximum permissible doses of ibuprofen, assuming that the maximum safe dosage is 40 mg per 1 kg of body weight. Maximum daily drug is the maximum permissible dose of ibuprofen that your child can take during the day, expressed in mg. Remember that it shouldn't be taken all at once, but in intervals between 6 and 8 hours. Maximum daily solution is the maximum daily dose recalculated to the volume of solution, using the same concentration as earlier. If you think your child needs more than the maximal dose, it's possible to use ibuprofen and paracetamol alternately. Please consult your pediatrician before administering more drugs to your child. Ibuprofen amount: it's calculated as the product of drug dosage and child's weight. It will be 10 * 35 = 350 mg. Maximum daily drug: it's calculated as the product of the maximum safe dosage and child's weight. In this case, it will be equal to 40 * 35 = 1400 mg per day. Solution amount: it is the ibuprofen amount divided by the concentration. In this case, 350/20 = 17.5 ml of solution will be required. Maximum daily solution: similarly, this is the maximum daily drug divided by solution strength. It will be equal to 1400/20 = 70 ml. Ibuprofen Dosage Calculator can be embedded on your website to enrich the content you wrote and make it easier for your visitors to understand your message.